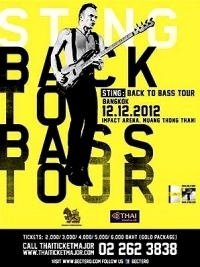 Sting was full of power and energy when performing the Bangkok concert as part of his Back to Bass Tour on Wednesday night. The English singer-songwriter sang powerfully and played his bass energetically almost non-stop during the two-hour concert at the 12,000-seat Impact Arena, which was slightly more than half full. For a man 61 years of age, that was fantastic. Yet Sting - whose real name is Gordon Sumner - still has a physique and energy enviable to most men his age. He was involved in every one of the 22 songs performed that night and took only brief breaks during the three encores featuring five songs, including 'Every Breath You Take' and 'Next to You' - the classic hits from his time with the Police. Sting was the lead vocalist, principal songwriter, and bassist for the English rock band of the late '70s and early '80s. Other songs from the Police era included 'Roxanne', 'Message in a Bottle', 'De Do Do Do, De Da Da Da', 'Shape of My Heart', 'Wrapped Around Your Finger', 'Every Little Thing She Does is Magic' and 'Driven to Tears'. An exciting segment by Sting on bass, Peter Tickell on electric violin and Dominic Miller on guitar wowed the audience during 'Driven to Tears' and drew big applause. There were also Sting's hits as a solo artist, including 'Fields of Gold', 'Englishman in New York' and 'Fragile'. Sting and his band of four musicians and backing singer Jo Lawry captivated the audience early with their exciting performance. He also tried to please his Thai audience by making a wai, saying thank you in Thai, and trying some other local words. The backup singer managed to steal some moments for herself, especially during 'Hounds of Winter' when her voice reached superhuman levels. Many of the audience members - several expatriates included - stood up, clapped their hands and danced along. Less than halfway through the concert, many enthusiastic fans gathered along the aisles near the stage, including a big man with crutches who sometimes held them up above his head. Another impressive moment was when the musicians - including David Sancious on keyboards and Vinnie Colaiuta on drums - performed electrifying solos, with Sting on bass. Before Sting's concert, Norwegian singer Dagny performed a 20-minute opening set. Her performance was satisfactory, according to the comments by her new Thai fans on her Facebook page. They couldn't wait until the next morning to write how they felt about her pre-concert show. Sting's Back to Bass Tour began in October last year in the United States and is covering the major cities of North America, Europe, Africa and Asia. His Bangkok concert was not sold out, but it was memorable and full of fun for many in the audience, who will certainly wait for his next return to Thailand. Check out the latest Virtual Ticket video from Danny Nolan – lighting designer on the Back to Bass Tour - discussing his role on the tour and sharing a few stories from the road!